SOMETHING MYSTERIOUS ROCKED ALL THE BOATS IN THE MARINA! Living in a floating home brings adventures every single day! Big yachts pass by, leaving a wake in a no-wake zone. The boat starts pitching to and fro and we all find that a LOT of fun! Storms blow in during the rainy season and, when the front of the storm hits, the winds pick up instantly, the temperature drops, and the boat starts pitching around again. Sometimes, if you don’t secure the hatch above your bed correctly, you wake up to rain falling on you. That’s always an adventure! But, sometimes, with no warning at all, all the boats in the marina start moving. Sometimes just a bit and sometimes a whole LOT! We were sitting out in the cockpit of “No Tan Lines” (Tanny) last night. No storms were nearby. There was hardly any wind at all. And, no boats had passed by at all. A single paddle-boarder (a friend of ours) quietly glided by in the still water. We said hello. He waved and kept paddling by. If any of you know of an unseen force that can cause something like this, please send me a note because the curiosity is killing us! A couple of weeks ago, we heard about Irma, a monster hurricane brewing in the Atlantic. Since we’ve had a small hurricane, as well as two tropical storms here in the past year, we weren’t too concerned. I mean, statistically speaking, what were the chances we’d get another one this soon? Regardless, we made sure to stock up on water and gasoline early, just in case. And, it’s a good thing we did because, a week later, all the stores here were out of bottled water, as well as any container that you could reasonably store water in. As the days passed, and as the forecast changed, showing Irma heading up our coast, we became increasingly alarmed. 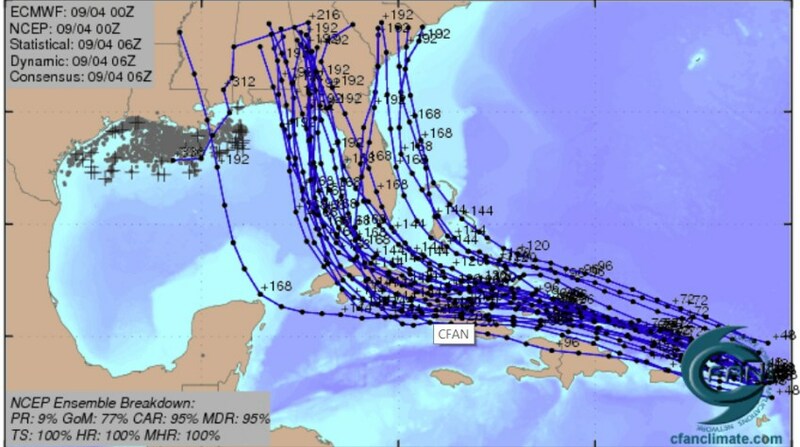 Which way would Irma go?? It was maddening trying to decide what to do!! We decided to pack up our personal belongings, secure the boats as best we could, and head to Orlando. BookLocker‘s Operations Manager (and WritersWeekly‘s Managing Editor), Brian, would stay with his mother in her assisted living facility, which is a tall building. He would be safe, and would be able to check on the boats after the storm. We’d planned to leave on Thursday morning. But, come Wednesday morning, everybody else had the same idea. The freeways were gridlocked and people were running out of gas because the stations were empty. Worse, people were dying in car accidents while fleeing a storm that was meandering all over the place! That’s when the forecast changed again. Irma was going to head right up the middle of the state, and hit Orlando. We cancelled our Orlando hotel reservation, and tried to get into a sturdy hotel here. It appeared all the hotels were full so the boys’ tutor, Cindy, offered to let us bunk in her living room. She’s not in a flood zone. But, then there was a new obstacle. Her daughter is deathly allergic to cats. We have a cat, Rambo. Cindy was in the middle of trying to find a neighbor to keep Rambo when Richard got back online and checked with the Hilton, which is two blocks from the marina. It’s a waterfront hotel. Maybe few people would think that’s a good place for a hurricane evacuation? (We soon found that the Coast Guard had selected this hotel to house several of its Search and Rescue personnel during the storm.) He tried to get rooms at the Hilton but the websites kept saying they were full. Yet, they would then flash available dates and those were the dates we wanted. I had Richard drive up to the Hilton and they did have rooms. He reserved two. We also found out that hurricane rates would apply, thank goodness. And, at the urging of Governor Rick Scott, the pet restrictions had been waived. We were all saved! The forecast changed again. Irma was going to march up the east coast. Shwew! We kept the hotel reservation just to be safe and we spent one day relaxing before we learned that Irma was coming in our direction once again. So, we reverted right back to panic mode! We briefly considered changing our plans again but it was obvious Irma was following us. We chose to stay put, and to wield our swords for the battle! We packed up all of our personal items, choosing to leave only the tools and boat supplies in the boat. The fridge and freezer had to be emptied. We bought extra duffel bags for our belongings. We kept filling up water containers. We were running on the assumption that we’d have no boat to come home to, and that our city might be uninhabitable. It was a terrifying thought but we had to keep moving forward, keep busy, and do whatever we could to save whatever we could. I think I slept three hours in four days. A friend told us that someone could check into the hotel and refuse to leave so we could be without rooms after all. So, Richard drove to the hotel once again to get the rooms two days early. That was a good thing because he had a LOT of stuff to haul there. And, Brian had stuff to haul, too. He decided to stay at the Hilton as well so he could be within walking distance of the boats. Between our emergency supplies and Capt. Brian’s – we were confident we could hold out for a prolonged period without electricity or drinking water. On a whim, I called local parking garages. We found two spots and put the “newer” cars in there (my Mustang and Brian’s SUV). We kept the truck with us for hauling things. It’s very old and rusty but still runs like a champ. We figured, if we’re gonna lose one vehicle, that’s the one that needs to go. I doubt it’s worth $400 at this point but we do have it fully insured. Two-week old Jack snoozed through the hurricane. Our daughter and son-in-law have a 10-day-old baby, Jack, and they live in a class A flood zone in Bradenton. They would join us at the hotel, along with his brother and his brother’s girlfriend. Between those two families, there were four dogs and three cats. I have to admit…I was happy I wasn’t staying in THAT room! We have one dog and one cat. Friday (Max’s birthday! ), the day before we were to feel the first effects of the storm, we woke up to a stiff breeze from the east that never eased. Even if we didn’t have radar or The Weather Channel, we’d have known something huge was brewing. And, that was two days before the storm hit. We spent the day furiously making final preparations, and moving things to the hotel. Brian tied and retied lines, trying to gauge the best possible set-up for how we thought the storm might pass. Max helped other people on the dock get their boats ready. My phone rang constantly. Friends and relatives far and wide were worried about us. Unfortunately, I didn’t have time for phone conversations. Our plan was to stay in the Hilton that night. Richard drove the boys and pets to the hotel around dinner-time, telling them to order room service for all, and we’d eat it later. We apologized several times to Max about needing to delay his birthday. He was such a good sport about it! Earlier in the week, Capt. Brian helped us remove our 4 sails, and lash down the booms. Richard came back to the marina after dropping off the boys. The wind was whipping pretty good! We got the last of our belongings off and then we helped some neighbors who were also trying to evacuate. Earlier in the week, at the suggestion of a friend, Brian had run some “long lines” behind our boat, all the way to the dock behind ours, and sank them. The idea was to pull them up tight just before the storm hit. Late that night, when the weather started getting really bad, we decided it was time. No other boats would possibly attempt to come into, or leave, the marina in those conditions. And, about an hour later, as I was helping our friend, Chris, remove her bimini-top, I saw bright lights and heard shouting. A boat was coming! I screamed to Brian down the dock. He took off running, waving his arms, telling them to stop. He dropped the lines once again as the crew on that boat kept hollering at us. Our lines never touched their propellers. They’d seen them in the water early enough because they had huge spotlights on their boat. And, why did they have spotlights? Because it was the Coast Guard! Richard talked to them later and they understood what we were doing. They were not upset. Finally, around midnight, we were able to leave the dock. On the way to the parking lot, I felt something funny under my right sandal. I’ve had a pair of sturdy Teva sandals for 10 years. The sole of the right one was half-way torn off. I reached down and tore it the rest of the way off. A few steps later, I felt the exact same thing on my left foot. I looked and, sure enough, that one was coming off, too. What?! After 10 years, both sandals broke within a minute of each other? Both of my 10-year-old TEVA sandals broke at the same time! Earlier in the day, our battery charging system stopped working. We MUST have battery power to run the bilge pumps. No bilge pump means your boat sinks. The marina was going to cut off power the following day so we HAD to have the batteries. We got the charger working again but it was charging slowly. We were nauseated by that development. About an hour before we were going to leave the marina, our companionway door (“front door”) broke clean in half. It’s a beautiful teak door. It just…broke! Brian had to hurriedly fix it with a spare piece of wood, drilling it into the back. It was ugly but it worked! Without a “front door” to keep out the estimated 10-15 inches of rain, the boat would sink. And, then, both sandals of the pair, which I’d had for 10 years, broke within seconds of each other. Something bad was going to happen. I was even more nauseated with fear than I’d been all week! As we were leaving, we saw the last person on the dock. It was Derek. He has a large motoryacht with a wood hull. It’s pretty old and the hull is a bit soggy. He couldn’t get insurance on it because of the condition of the hull. He’d just bought the boat and hoped to recondition the hull at some point. After we made sure all our neighbors were as prepared as they could be, and that nobody else needed help, we finally folded our weary bones into the truck, and drove to the hotel. Everybody else was already there. Tempers were short. Everybody was extremely stressed. We had all spent the past week thinking we’d be homeless in a few days, and we all made all the exhausting preparations to prepare for that. We wolfed down our room service burgers and we promptly went to bed. Max didn’t even eat a bite of the birthday cake Richard had miraculously managed to bake on the boat that afternoon during all the hullabaloo. The next morning, we learned that a local bank’s parking garage had opened up to the public. We moved the truck and the adult kids’ vehicles to that. We ate one last meal at the hotel restaurant before they moved meals to the convention room. We would be eating buffet style for the next few days. The hotel set up a play area for the kids in there, complete with video games and a very large screen, which played animated movies. Most of our marina friends were also at the Hilton so each meal was like a party. Each buffet meal at the hotel was another opportunity to gather with our dock friends, and support each other. The hotel left notes under each door with the hurricane rules. Don’t leave when the storm starts to hit (they’d be shutting off the elevators at six the next evening). No more than two drinks per person per night in the bar (excellent rule). Clean up after your pets. They were expecting a storm surge of 5-15 feet and the first and second floors might end up under water. We would probably lose satellite TV service before we lost power and Internet, etc. On Saturday, we furiously tried to get caught up on some work, knowing we might be without power and Internet for several days…or more. The guys (and me) planned to meet at the front door of the hotel at 5:00 p.m. That’s when we found out there was a 5:00 curfew in our city so we had to bump it up to 3:00 p.m.
We all had on our rain gear and we walked the two blocks to the marina, dodging flying palm fronds and small branches. The winds were blowing at about 50 mph. Once we arrived, we saw several boats in distress. Some of the smaller sailboats were in the mud because of the low tide. They were at risk of getting stuck under the pier when the tide came back up later. Multiple boats needed line adjustments for various reasons, including the fact that they were rubbing on the docks. I wasn’t much help muscling boats that were stuck in the mud but I was very happy to be the dock photographer! I got some great photos and videos and I posted them online so our dock neighbors who were out of town could see the condition of their boats. We were out there for about an hour and a half and my phone died during that time. The sideways rain felt like needles and the gusts were so strong that they threatened to knock us down. Several times, we’d brace our feet against a gust and, more than once, I grabbed onto a dock box for support. The sound of the wind in the rigging was deafening and we had to shout at each other to be heard. 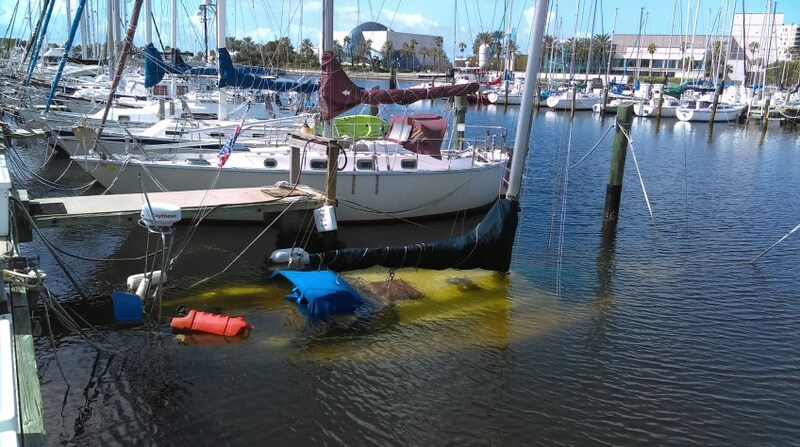 In this case, Brian (in red), and a neighbor had to muscle a boat out from under a dock piling, and wedge a bumper into the space so that the vessel could rise with the water. Normally these boats float level or just above the dock. The large wooden motor yacht (right) was still afloat, but hitting ground at this point. Neighbors, Bob and Dean, adjusting lines in the wind and rain. We made it back to the hotel after an hour and a half and Richard had been frantic with worry because he hadn’t been able to reach me. I reassured him that there were seven of us on the dock and that we were never in danger. Even if one of us had fallen in, someone else would have fished them out. The real danger was all the flying debris but I didn’t mention that to Richard. We hunkered down at the hotel, and prepared for the loss of power and Internet. We felt very safe at the hotel but we still feared being homeless in a matter of hours. That feeling was truly awful. But, it never got really bad – not here in St. Pete anyway. Oh, sure it was blowing and raining like CRAZY! But, I don’t think the winds at the hotel ever exceeded 80 mph. With the guys snoozing contently, exhausted from our ordeal, I stood by the window, watching the fury of Irma, thinking about how terrified we’d been for the past week, how much we’d done as a family and a team with our neighbors over the past week, and how we’d just been talking 36 hours earlier about what city we might relocate to if ours was destroyed. And, looking out at rain sheets that resembled white silk billowing across the black sky, I knew we were all going to be okay. After the eye passed just northeast of us, I was finally able to sigh with relief, and I went to sleep. I kept my clothes on because we were still at risk of tornadoes, or debris breaking a window, but I knew deep down that everything would be okay. A huge storm surge was still possible by that was looking less and less likely. Unfortunately, our friend Derek’s boat didn’t make it. 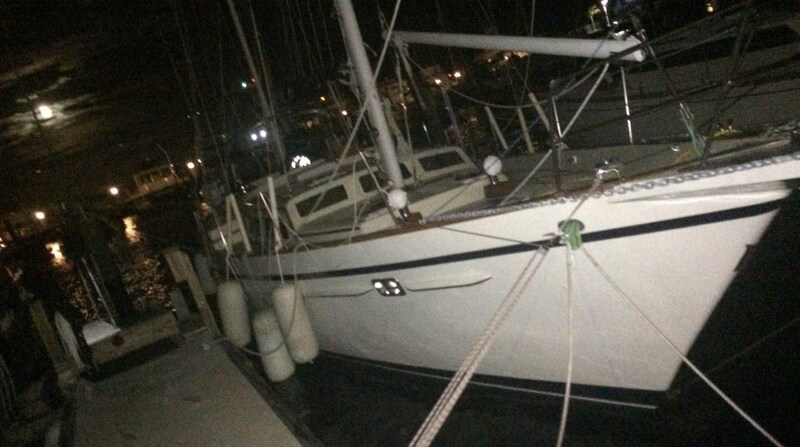 Sometime in the middle of the night, two of the guys went back out to the marina and, sadly, discovered that one of the boats had sunk. It was Derek’s. The one with the wood hull. A boat is a part of the family. Boats take on lives of their own. To mariners, they are their partner when battling a raging sea. 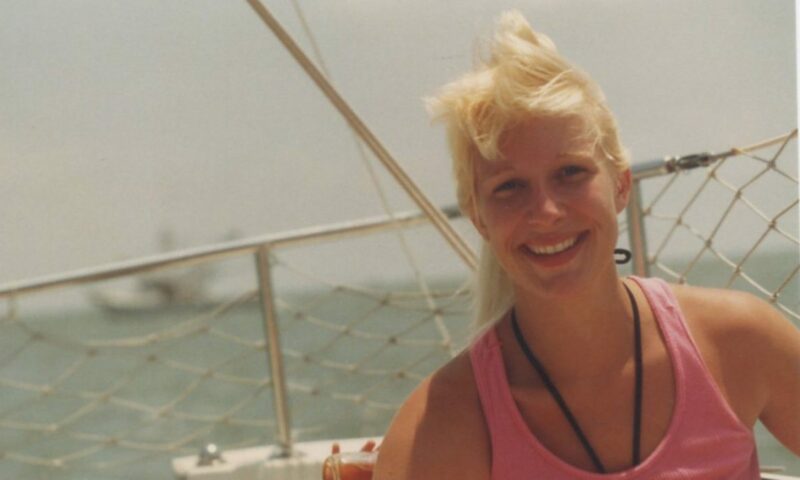 When a boat is lost, a family member is lost. We all were and still are in mourning over that. They are planning to “float” that boat tomorrow to see if it can be saved. The cost? $30,000, which is more than he paid for the boat. First light saw us jumping up to look out the window. It was still blowing hard and it was still pouring but it was nothing like it had been the night before. We ate breakfast (a continental breakfast – no rice and beans!) and got the truck out of the parking garage. We left the boys at the hotel, and drove to the marina. There was debris EVERYWHERE! Downed trees, huge tree limbs that has broken away from their hosts, millions of palm fronds (people here won’t need to trim their palm trees for a year or more! ), broken street signs, toppled newspaper boxes, and more. At the marina, there were torn sails and, unfortunately, seven sunken boats. Ours was not one of them, and neither was Brian’s. We were devastated for our neighbors. This boat apparently had its lines too tight in anticipation for tidal surge. When the water dropped instead, it tipped and filled up instead. Sunken power boat under the covered slips. Seven boats sank on the south side of the marina. This one was “floated” just two days after the storm. The owner is 90 years old! Our cockpit was full of water but it hadn’t yet spilled down the companionway and into the boat. We manually pumped it out, and learned later it was because we’d closed one of the seacocks that should always remain open (oops). Our neighbor made the same mistake but he did get water inside his boat. We manually pumped his out, too, because he was out of town. People were out and about, surveying the damage. While there is a LOT of clean-up to do, St. Pete survived! And, oddly enough, we never lost power, nor Internet! Many of our Florida neighbors were not so lucky and there are a lot of people who did lose their homes, and who have nowhere to go. Tomorrow night, a crew is coming to try to float the large, sunken motoryacht. We’re not sure she can be saved. Tomorrow night we’ll be having a dock party – a “We Survived Irma!” celebration. This marina is, by far, the nicest, most caring and loving neighborhood we’ve ever lived in. We are so blessed that we didn’t lose our neighborhood or neighbors to Irma. Everybody pitched in to help everyone else. If it wasn’t such a tight-knit community, I’m sure even more boats would have been lost, and more neighbors would have been displaced. Today, we are counting our blessings and trying to physically and emotionally recover from what we’ve been through over the past week and a half. I’ve been waking up with hurricane nightmares several times a night, which is odd because I felt like I’d handled it all pretty well, under the circumstances. Other friends are admitting having anxiety, lost sleep, nightmares and more after what they’ve been through. The boys, Max and Mason, came through essentially unscathed. We kept things light-hearted (when we could) during the ordeal, and repeatedly assured them that things would eventually be just fine. As long as we have each other, none of the material things matter. While we don’t need to relocate and rebuild from this storm, the time might just come when we must do so. And, I believe, after this experience, that we will be far better equipped to handle such a tragedy. POSTSCRIPT: While the Hilton was great to us during the storm, they weren’t so great to us today. We had arranged with the front desk to allow our daughter (who’s recovering from surgery), her husband, and our 2-week-old grand-baby to stay there “as long as they needed” due to their situation. All of the sudden, this morning, the Hilton said they were overbooked and that Ali and the baby needed to be out by 1:00. Remember, they’d said she could stay and they have our credit card, and having been charging it daily. OH, Hell NO! Mama Bear (Grandma Bear?) stepped in. I immediately drove to the hotel, and demanded to see the manager. I sternly explained to him what had occurred, and that our daughter was not only recovering from major surgery, but that she also has a two-week-old infant. I further explained that her husband was working at his job in Bradenton and that she didn’t have the baby’s car seat with her. I guess my red face and shaking hands worked because they miraculously found room for her! There was no way I was going to let them kick out a new mother and her infant when there were all sorts of healthy people in that hotel who could find another place to stay. (There are other hotel rooms in town – we checked.). If they’d resisted, I would have said, “She’s not leaving. You call the cops while I call the local news stations.” But, the manager agreed to let her stay…for one more day. I’m still very angry that they tried to do that to her. It wasn’t our or her fault that they overbooked. One more day, however, wasn’t enough but it did buy us some time. When hours went by without the general manager calling me back, I posted a public note on Facebook and it started to go viral. People were tagging Hilton and the local news media on the post. The general manager then called and, suddenly, they’d found room for Ali and the baby for another week. We are once again happy with the Hilton. They did the right thing and I then removed the Facebook post (an hour after posting an update). NEXT: SOMETHING MYSTERIOUS ROCKED ALL THE BOATS IN THE MARINA! WE ARE PREPARING FOR HURRICANE IRMA AND WE ARE VERY AFRAID! If you’re just tuning in, CLICK HERE to start at the beginning. We are all currently planning to evacuate to Orlando on Thursday morning if Hurricane Irma heads our way. We are frantically making lists, and packing up our essential items. Most terrifying of all, we’re not sure what we’re going to come home to, nor even a marina. We have insurance but it took us a year to find this boat and we’re not looking forward to starting all over. But, we will if we have to. I explained to all the children (young ones and adult) that what matters most is that we’re all safe. Everything material can be replaced. NEXT: HURRICANE IRMA WAS TERRIFYING!